Arborealis - kwekerij met groot assortiment Hydrangea's (hortensia) en viburnum : met o.a. Hydrangea hirta, Hydrangea arborescens 'Pink Pincushion', 'Hill's of Snow' - 'Samantha' 'Vasterival' - Annabelle' - Hydr. aborescens 'Puffed' Green', 'Sheep Cloud', 'White Dome'....., Hydrangea aspera 'Mauvette', 'Macrophylla' 'Rowallane' Hydrangea aspera. sups. 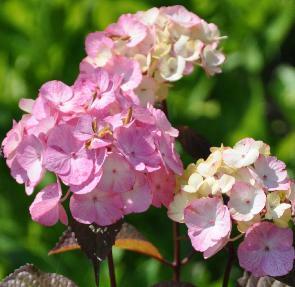 Sargentiana, Hydrangea heteromalla 'Jermyn's Lace' - 'Krista' - 'Gidie' - 'Nepal Beauty' - 'Long White' - 'Willy' - 'Snowcap' -'Morrey's Form' - Hydr. 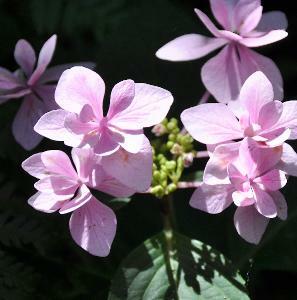 involucrata ' Plena' - 'Viridiscens' - 'Sterilis'- 'Hortensis' - 'Yokudanka' - Hydrangea macrophylla ' All Summer Beauty, Blue Billow, Blauer Zwerg, Ayesha, Alpengluhen, Blaumeise, Bodensee - voor volledige lijst zie catalogus online - ook tal van Hydrangea paniculata's : 'Ammarin' - ' Dart's Little Dot' - 'Dolly' - 'Burgundy Lace' - 'Dharuma' - 'Early Sensation'- ' Greenspire' - 'Harry's Souvenir' - Kyushu - Mathilde - Phantom- Pee Wee - Pink Diamond - 'Papillon' . 'Pinky Winky' - 'Ruby'-' Tender Rose' - Unique - Vanille Fraise - White Lady.... - Hydrangea serrata met o.a. : 'Preziosa' - 'Benigaku' - ' Blue Deckle' - ' Akabe Yama' - 'Blue Bird' - 'Grayswood' - 'Hallasan'- 'Kurenai' -'Koreana' - 'Kurohime' - 'Prolifera'- 'Ramis Pictus' - 'Rosalba' - Spreading Beauty' - Hydrangea villosa - ' Anthony Bullivant' . - WEBWINKEL !